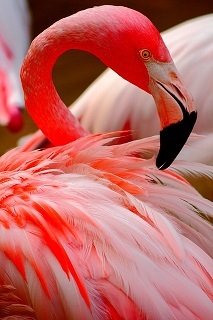 We'll be in the pink with think beautiful flamingo tea cosy design. In the TeaCosyFolk Facebook group we were having a chat about tea cosy designs for 2019 and members were throwing their ideas into the mix. 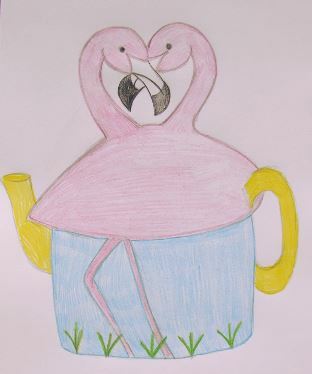 The flamingo tea cosy design is as a result of that smelting pot of ideas. It's lovely to knit from nature because what is natural is a beautiful thing. 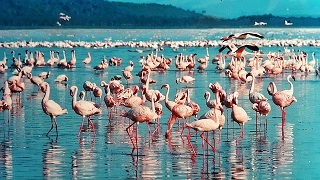 Flamingos are funny looking birds and its not only because of their pink plumage, but they have funny beaks and legs that seem to bend the wrong way, but when you look at images of them, what is beautiful is that they look very affectionate to one another. With Valentine's only just around the corner I thought it would be lovely to make a flamingo tea cosy to celebrate. Check out the photos below, just look how their heads together look like they make a love heart - how perfect is that? I love it. 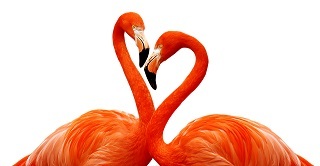 My tea cosy design is very simply, two flamingos touching heads in a greeting posture to create a love heart shape. The base of the cosy will be half water and grasses and the top will be pink flamingos. The challenge will be how to get the heads to stay in that position and not droop or fall over. I'm really excited to be knitting in pink! In the world of tea cosies, pink is rarely called for!